That is the question…or is it? Thinking back to an earlier article on the basics of carbohydrates (Understanding Carbohydrates: The Substrate King! ), we established through a quick metabolism lesson that carbohydrates are seen as the king of exercise substrates and that their primary role is to provide energy to the working muscles. However, we also know that carbohydrates are also a major player in the storage of energy (glucose) as glycogen, and it is then through a metabolic process called glycogenolysis which rapidly breaks down this stored energy (glycogen) that we are able to utilize it for performance. Therefore, because the body can store on average 500-600g/CHO (~2000kcals, or 2-4hrs of moderate intensity exercise) (1,2), it may not be necessary to consume any kind of fuel during a shorter event such as a 10k or a half-marathon. However, this will depend on several other factors, for example; your pre-race nutritional strategy, hydration status, fitness level, actual race pace, mental preparation, tactics, personal habits, mood, and even the weather may impact on your choice to fuel during a shorter event or not. Due to our body’s ability to store carbohydrates as glycogen (see Video 1), as long as we have consumed the correct amounts of carbohydrates in the 24-48hrs (3) building up to the event, then fuelling during the race should not really be a primary focus. 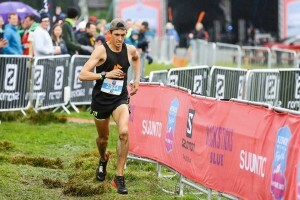 However, there are exceptions to the ‘rule’, for example, not eating correctly before the event may cause glycogen levels to be depleted and therefore leave the ‘tank a little empty’ in which case a little fuel may be needed during the event. Your race pace and fitness levels may dictate that you need to fuel during an event, even the shorter ones if you are a ‘back of the pack runner’ you really need to think of how long you are going to be out on your feet and whether or not you will need to replenish at some point during the event…THINK HOW LONG, NOT HOW FAR!!. Maybe even the weather could force an athlete to fuel during an event distance which he/she may not generally take onboard any fuel, for example, very hot and humid summer fell races can be extremely intensive (especially those 15-20k ones) and it may just be sensible to carry a small bottle of carbohydrate/electrolyte fluid such as Mountain Fuel® Xtreme Energy Fuel drink to help keep up hydration levels, but also to drip feed those vital glycogen reserves throughout the race. There is also the option of carrying a Sports Jelly or two for a quicker, sudden hit of glucose if you so choose alongside our Mountain Fuel® Xtreme Energy Fuel drink. 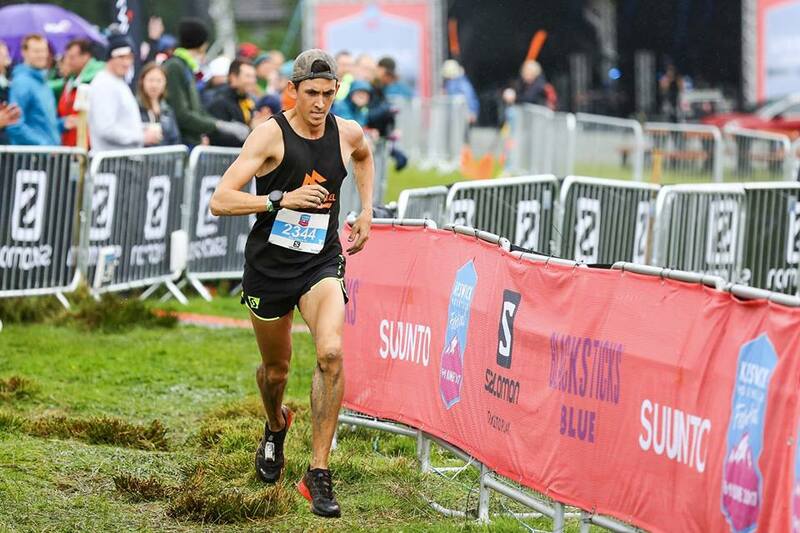 The key, with regards to nutrition and not having a gruelling horrible time during a shorter race such as a 10k or a half-marathon is the build-up period to the event! Using the car analogy again, if I may?!. Anybody with any common sense would put fuel in to their car before the start of a journey, and if it was only a short journey they generally wouldn’t stop during that journey to refuel. However, like I said earlier, there are exceptions, so that’s not to say that you couldn’t start the journey with a little less fuel in the tank, and then top up during your journey. But this just isn’t optimizing best practice, nor is it sensible, as its time consuming, an effort, inconvenient, possibly going to cause sudden GI-stress, and just sometimes damn right bad-timing, if you’ve just reached the top of a gruelling climb and you are just about to enjoy 20-minutes of arm-flailing, leg-cartwheeling single-track descent when you realise that the climb has totally depleted your glycogen stores and now you need to quickly get some energy to your muscles…”Grrrr! !...Should have eaten something earlier”!! With regards to these shorter races I have mentioned, an increase of carbohydrates (~70-75%/CHO/total daily kcals) (2) in your diet during the 24-48 hours building up to the event should typically top up your glycogen stores and give you plenty of energy for the race as long as you already consume an adequate amount of carbohydrates in your day-to-day diet (a sudden large increase in carbohydrates in your diet may lead to adverse effects, so be sensible in your approach!!). These increases in carbohydrates can easily be undertaken by increasing foods such as rice, potatoes, pasta, fresh fruit, and carbohydrate loaded drinks such as the aforementioned Mountain Fuel® Xtreme Energy Fuel drink which can be sipped throughout the days building up to the event, and on the morning of the event to help top up crucial glycogen levels pre-race. 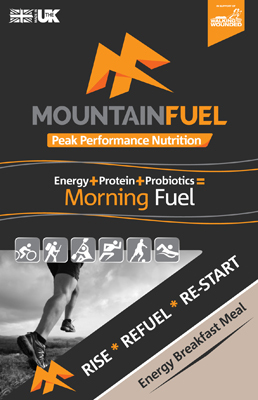 Mountain Fuel® Morning Fuel may also be used as a pre-race breakfast alternative, and is delicious with fresh berries and a little maple syrup. The importance of getting your pre-race nutritional strategy correct is vital for a successful race, though it is also important to help in post-race recovery and glycogen replenishment (4), after competitive events, but primarily for in-between repetitive training sessions and consecutive phases of heavy endurance training (5). Research suggests that a diet containing ~8g/CHO/kg.bw per day is adequate to maintain muscle glycogen stores, but consequently, a diet containing only ~5g/CHO/kg.bw per day will not be adequate and will result in significant decrements to muscle glycogen storage (6,7). To aid in pre-race recovery and glycogen replenishment it is advisable to consume both protein, containing the essential amino acids, plus carbohydrates in one form or another, for example, and on a personal level, I have found that 500ml of Mountain Fuel® Recovery drink (sometimes with a cheeky extra scoop in) asap after training/racing helps with muscle recovery, and then over the course of the next 2-4 hours 0.5-2ltrs of Mountain Fuel® Xtreme Energy Fuel helps to quickly and efficiently begin to replenish glycogen and electrolyte levels, ready for the next day’s training or racing. For short races such as 10k-half-marathon distances, nutrition is key more so before the event, rather than during the event. Know yourself, your limits, and if you will need to feed during shorter races…DO NOT IGNORE YOURSELF, ITS RUDE, AND YOU’LL NEVER FORGIVE YOURSELF! !